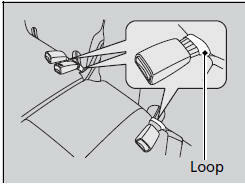 Pull the lever on the right to change the angle of the right half of the seat-back, and left for the left half. 1. Unlatch the detachable anchor from the anchor buckle and store the detachable anchor in the retractor housing. 2. 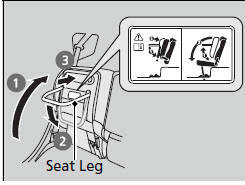 Pull the release lever and fold down the seat-back. The rear seat-backs can be folded down to accommodate bulkier items in the cargo area. Never drive with a seat-back folded down and the tailgate open. To lock a seat-back upright, push it backwards until it locks. When returning a seat-back to it’s original position, push it firmly back. Also, make sure all rear shoulder belts are positioned in front of the seatback, and the center shoulder belt is re-positioned in the guide. 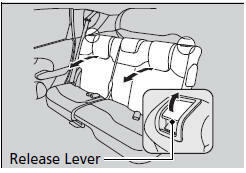 Make sure that the folded seat-back does not press against the front passenger seat, as this can cause the front passenger seat weight sensor to work improperly. 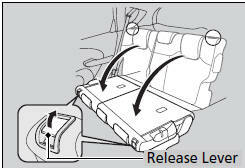 Separately lift up the left and right halves of the rear seat cushions to make room for cargo area. 1. Make sure the seat belt buckles are in their loops on the seat. 2. Pull up the rear seat cushion. 3. Fold the seat leg down. 4. Push the seat cushion firmly against the seat-back to lock it. 1. Hold the seat cushion in the upright position, and pull up the seat leg fully. ► The seat cushion can abruptly fall down once you pull up the seat leg. 2. Slowly put down the seat cushion and set the seat leg in the floor guide. 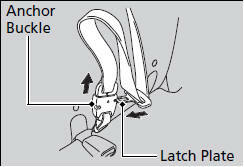 ► A latch comes out when the leg is set properly. After you fold the seat up, or put it back in the original position, make sure the seat is firmly secured by rocking it forward and back. Check if there are any items on the seat before you pull the seat cushion up. 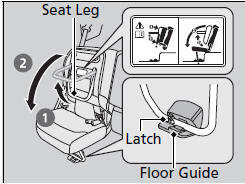 Check if there are any obstacles around the floor guide before you put the seat back in the original position.